Travelers often keep a record of their adventures, detailing the people, landscape and stories of foreign lands through words and images. Newfoundland and Labrador had many short and long-term visitors arrive on its rocky shores in the 18th, 19th and 20th centuries, and some of the stories and images of those long–ago travels have found their way back. A lot of the best, most detailed and finely preserved accounts are by women. One example would be the diaries of Jessie Luther (1860-1952), a New England woman who was recruited by the International Grenfell Association in St. Anthony to help develop a crafts-based cottage industry. 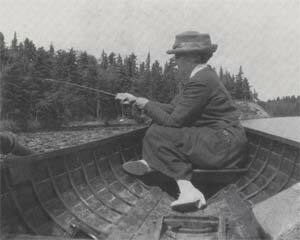 Jessie lived and worked in Newfoundland and Labrador from 1906 to 1914, capturing a very specific time in the development of the province in her detailed diaries. Years later, Rhoda Dawson (1897-1992) was also hired to work for the International Grenfell Association in St. Anthony. Originally from Chiswick, England, Rhoda taught crafts and designed some of the hooked mats for which the association was so well known. At 33, Rhoda was already an established artist when she arrived in Newfoundland in 1930, and her drawings and writing on life in Northern Newfoundland and Labrador are both insightful and entertaining. Edith Watson (1861–1943) did not come to Newfoundland with the Grenfell Association (although there is evidence that she was acquainted with Dr. Grenfell) but bravely, perhaps stubbornly, and certainly enthusiastically, Edith came to the island on her own in the mid 1890s. She arrived with a camera strapped around her neck, intent on capturing the essence of the local people through her lens. She returned often with her partner in life and work, Victoria Hayward, over the course of her thirty year career in photography. See an example of an Edith Watson photograph here. 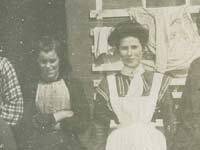 Some women accompanied their husbands, whose work and religious purpose brought them to Newfoundland and Labrador. These included the Moravian missionary wives from Europe, who came with their families as early as 1770 to help establish Christian missions to the Inuit of Labrador. For a brief time in the early 20th century, there were several women from Lapland residing with their families in the province. They were married to reindeer handlers who had been hired to provide training to the local population when 300 reindeer were imported to Newfoundland in an attempt to broaden the species base of the island. The women from the outside world who visited Newfoundland and Labrador were teachers, writers, nurses, artists, wives and mothers. Some stayed for a few months while others settled and stayed for years. 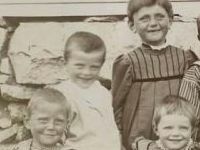 They left their mark in the historical documents, photographs, diary accounts, artwork and stories preserved in their absence, providing a window into the culture and society of the 18th, 19th and 20th centuries.